Measurement results obtained using Monoscope test on FPD Benchmark Blu-ray disc. The bigger the number, the more details are visible on the screen. These results are especially important since the advent of LED LCD TVs and new way manufacturers are panel refresh rate. This lead to much higher number of “hertz” that we see today in the specs, sometimes followed by mysterious three letter abbreviations, e.g. 1400 Picture Quality Index (PMI), 2400 Hz Perfect Motion Rate (PMR) or 2300 PMI (Picture Mastering Index). 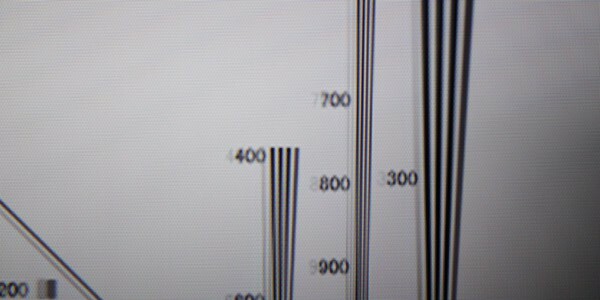 The issue is, behind those numbers often are only 60 Hz panels powered by different LED Backlight techniques (blinking, scanning, black frame insertion), that together can improve perception of higher motion resolution, but more often with introduced negative effects like doubling of objects, dimmer picture, flickering and so on. BFI – Black Frame Insertion (technique of inserting black frames between original frames in order to achieve sharper moving image. Negative side is reduced luminance of the screen, doubling of objects and depending on the source type – flickering. This technique is used primarily on LED LCD and on few OLED TVs.